Our good friends over at Licorice International recently sent me a little licorice care package containing, among other things, a sample of Dutch company Katja’s Apekoppen. Needless to say, I was overjoyed to get the chance to try a new kind of licorice! 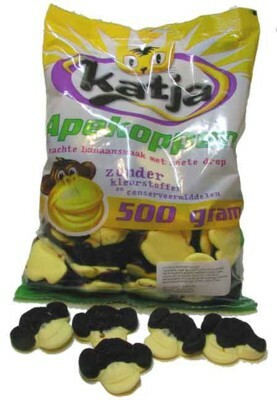 Apekoppen, translated as Apeheads, are half brown/half white ape-shaped candies. I briefly skimmed an explanation of the confection and saw that they were actually a melding of banana and licorice flavors – the white part was banana, the black traditional black licorice. I immediately thought they were going to taste, well… disgusting. But, being the brave soul I am, I bravely forged ahead. Happily, I was rewarded with one of the most interesting licorice candies I’ve had in quite some time. Intrigued by the idea of a banana flavor, I decided to split the first piece in half and eat the banana bottom section first. The consistency was what struck me first – it reminded me very strongly of a somewhat more-dense-than-normal circus peanut. And, in fact, the flavor was right there as well. The only thing missing was the garish orange color. Admittedly, it didn’t taste much like banana, but it was still good. Next up was the top of the head, consisting mostly of ears. These were also a surprise – soft and moist, they were very very tasty licorice, with a wonderful salty/sweet flavor. Even without the interesting contrast of the bottom part, I’d enjoy eating these. However, that contrast really sets these above the rest. When eaten together, the two flavors are perfect complements. The “banana” tempers the slight bite of the black licorice, while the saltiness of the black licorice makes the sweetness of the “banana” less overpowering. To top it all off, the monkey face is really well done – lots of detail. Overall, I have to say that I loved this new treat, and highly recommend you head on over to Licorice International to try a few yourself. Until September 30, you’ll even get a free sample with any order! I am fortunate to live in Lincoln, NE, where Licorice International is located and I think I may have to take a trip to the store today! I used to not even like licorice but Ardith and Elizabeth carry the best products and are always generous with samples. huh. i always thought different flavors of licorice would be a good idea in one piece. i’m glad someone did that. maybe a berry flavor would be tasty with the licorice. banana is a pretty strong flavor. I really want to place a licorice order from that website– what else is good from them? Other than that, I recommend you look around and see what you think you might like – their descriptions are very good at giving you an idea of what the products taste like.